On Francoise Morechand’s living room table there sits a book once owned by a samurai in the Edo Period (1603-1867) that she says she has been studying. “I think I may have been a samurai once in a past life. But you know, I would never do hara-kiri. I would die in battle,” she declares. It is this strong sense of conviction and commitment that has garnered Madame Morechand a legion of confidantes and fans across a wide spectrum of societies — from the worlds of fashion, culture and politics, to name a few. 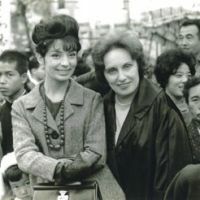 But to most people, she is Japan’s French flower, helming generations of France-Japan cultural understandings that all began with her breakout popularity in the 1950s as one of the first foreign tarento (television personalities). Francoise Morechand-Nagataki (as she is now formally called) was born in Paris to intellectual and artistic parents; her father was an adventure-seeking engineer and her mother was a pioneering teacher at the hugely prestigious Ecole des Beaux-Arts (School of Fine Arts) in Paris. Her grandmother was close to the renowned scientist Marie Curie, who in 1898 discovered radium. 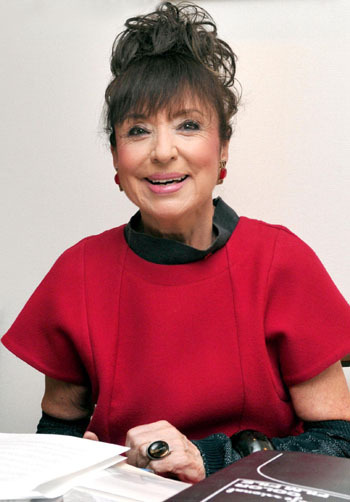 However, young Francoise’s idyllic Parisian life as an only child took a terrifying turn with the American bombing of Paris in the later stages of World War II, when she often shared a shelter with rats and was charged with assisting orphaned Jewish children that her liberal parents hid in their home. Her father didn’t escape torture from the Gestapo, condemning Morechand to a lifetime of nightmares in which death comes before confessions to the enemy. 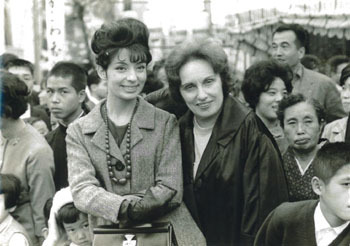 After the war, with an itch to travel, Morechand studied Japanese at university, then moved to Japan with her first husband, a French anthropologist, in 1958. As a restless young woman of 23, though, Morechand longed to be active in society and so took a job teaching French at Ochanomizu University for women in Tokyo. Only two years older than many of her students, she taught them about everyday Parisian life, using Jacques Prevert poetry collections as textbooks. 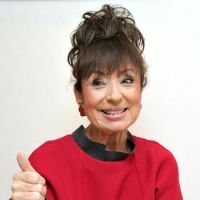 Then, as the 1964 Tokyo Olympics approached, she was hired by national broadcaster NHK to head-up its French-language television program — and it was that move which was to set her on the road to becoming a household name in Japan. What followed was a blitz of regular TV appearances, magazine columns to write, lectures to give and, of course, gaggles of female fans who copied her clothing and singular hair styles. It was a frenetic work pace that continued for seven years until her husband was transferred back to Paris. She followed, but not without many tears. The following 10 years saw her raising her only daughter, divorcing, and undertaking her first stints in the corporate world through jobs with Revlon and Christian Dior. Morechand’s return to Japan came about in 1974 when Chanel asked her to be director of its cosmetics division here. But when news got around that she had come back, her popularity again became so great that she left Chanel in order to pursue the myriad opportunities coming her way. It was also soon after returning that she met her current husband, author Tatsuji Nagataki, who has become a respected authority on French culture and the arts. With the help of her Japanese “other half,” Morechand built a brand around her name and became involved in a stream of projects. Among these was a fashion line she designed called “Morechand Kimono” that triggered a boom in “modern” kimono in the 1970s and ’80s. Then there was a fine jewelry line, a collection of lacquer dishes, and many others. 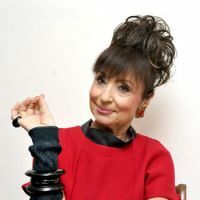 As well as all this, Morechand has published 28 books about fashion and lifestyle, including the best-sellers “Shippai Shinai Oshare” (“How to Dress so as Not to Fail”), which sold a million copies, and “La Gaijine” (gaijin means “foreigner” in Japanese), which is a story of her love affair with Japan. She is also a major supporter of the arts and fashion in Japan, who now acts as an adviser to the 21st Century Museum of Contemporary Art in Kanazawa, Ishikawa Prefecture. She was, too, involved in establishing Vogue Japan in 1999. Even now she is a fixture at Japan Fashion Week, lending her support and constructive criticism to both young and established designers alike. Meanwhile, Morechand’s wartime experiences have long brought out her caring and philanthropic nature, and she was a catalyst in establishing the Japan branch of the Medecins Sans Frontieres (Doctors Without Borders) and Medecins du Monde (Doctors of the World) nongovernmental aid organizations. Her tireless dedication to making the world a better place has been recognized with four honors from the French government, including the award of its highest decoration, the Legion d’honneur, in 2004. For this interview, I met Morechand in her sunny pied-a-terre in central Tokyo’s glitzy Roppongi 1-chome district, where she was keeping the company of her two white Persian cats. You came to Japan at a very young age; did you always have a Far East travel bug? My parents were artists and intellectuals from Paris, but we were not rich. Like all intellectuals in the 1930s, my father wanted to be an explorer, so he took me to lectures about the Eskimos, Latin America and the Amazon. I did have an incredible urge to travel, but I knew I needed to do it for work as I wasn’t able to afford it on my own. I originally wanted to be an interpreter of Chinese — but a friend of the family reminded me that China had just become a communist country, and as a Francophone I wouldn’t be allowed in. So he suggested I go to Japan instead — Japan! Well, this was the 1950s. It was still very soon after World War II, with fresh wounds between Japan and Europe. No one in Europe talked about Japan. That friend told me, “Japan may be battered now, but believe me, one day it will be on top of the world.” I then started taking Japanese-language lessons in France, and there I met my first husband. Soon after, we were married and he was transferred to Japan, where I went with him. What were your expectations of Japan? Well, I really had no idea about it. Back then, all we knew about was “Madame Butterfly,” and that it was an island country. Back in the ’50s, my family said I was crazy when I told them I was going to Japan. But I have always been seen as crazy because I have done things before anyone else all my life. There were only 300 French citizens in the entire country at the time. But I became bored playing the expat wife. It wasn’t how I was raised. How were you raised, then? Oh now this is a story. Really, you cannot know anything about me until you hear about my childhood, and how it has shaped my ideology. That’s because I grew up during World War II and witnessed my parents fighting hard against fascism. My father was an engineer at a steel factory and the Nazis wanted the steel to be sent to Berlin to create weapons. But my father knew he couldn’t let that happen, so at night he would gather secretly with workers he trusted to melt the steel and inject it with air so that it would break and become unusable. It wasn’t until later, when the war was pretty much over, that they were able to trace the sabotage back to my father. They captured him and tortured him. In fact, it was me as a child who opened the door to the Gestapo who took him away. He lost his sight because of the abuse. What a childhood. Were you shielded from most of the atrocities of the war? No, I remember it vividly! We would rush into the cellar and huddle with the rats while the Americans bombed the city. I would faint, but to me fainting was better than being awake. I can sleep anywhere now, even on a stone. I also recall one day when children started to show up at my house. They were orphans from Jewish families. I was in charge, with our maid, of meeting new arrivals in the park and then taking them home with us as if they were friends of mine. I was 6 years old and my maid was 18. We would play with the children in the sandbox in the park, and then go home all together, with many of them crying and screaming because they had just been left alone in the world. The Gestapo would stop us on the street, and we would tell them that they were cousins visiting from the countryside. I still get chills when I see the Gestapo uniform or anything inspired by it. As you know, it’s quite popular in fashion, but it doesn’t bring me good memories. Speaking of fashion, you have had a very close relationship with it, haven’t you. Well, fashion just came naturally for me. My mother was a painter and an instructor at the Ecole des Beaux-Arts, which was unusual because women generally didn’t work at that time. What was even more unusual was how she would use her paints as makeup — she was a pioneer! My father was very good friends with “The Little Prince” author Antoine de Saint-Exupery, who believed that progress would bring humanity happiness. My mother believed that beauty and aesthetic would do it. Fashion is a natural extension of these ideas, and thus I inherited a sense of style. You were once a fashion icon in Japan. How did that come about? As I said, I wasn’t very good at being an expat wife in Japan; I needed to work. So I took a position at Ochanomizu Univeristy as a French teacher. One of my students had a brother who worked at NHK. At the time they only had English educational language programs, but because of the Tokyo Olympics they knew they needed to expand to include other languages, such as French and German. I was hired, and the next thing I knew I was on television in black and white! I also didn’t have much money then, so to change my look I would just wear my hair differently for every episode. One day it would be up in a chignon, one day in a ponytail and one day in braids pinned up like a teapot handle. The next day, you would see women with braids up like a teapot handle! Was it then that you started to gain a fanbase? Well, I just learned this last year, but that language program had something like 14 percent viewership nationwide. That is unheard of for an educational program! Wow. Who were the audience? Well first, I had the diplomats, who were interested in seeing one of their own on TV. Then I had the Japanese businessmen who were doing more and more transactions in Europe. Then of course the young Japanese students watched — if only because we were close in age, as I was still only about 23 years old at the time. Then there were the housewives, who were interested in seeing what a fashionable Parisian was wearing. Finally, at that time most Japanese couldn’t travel, as there was a foreign-exchange restriction and it was a pittance: it would be like ¥250,000 today, and you can’t travel well on that. So programs like ours were the closest that the vast majority of people could get to foreign people and lands. So basically I had the entire population as my viewers! What followed that sort of attention? I started out on NHK, which meant that the commercial stations were wary about hiring me for their programs. But when they learned about the popularity of the show, eventually they were knocking down my door, asking me to come on their TV stations. I was never handled by a management company, so job offers would just come to my home by telephone, and my maid at the time, Suzuki-san, would take all the calls. Later on in my career I had 10 secretaries at one time, and even they couldn’t keep up with me and all of my projects. I was on seven different TV programs at once and I couldn’t walk down Ginza (a plush shopping street in central Tokyo) without a mob of people gathering around me. But it was never malicious; everyone was really gracious and kind. The salarymen would take off their jackets and ask me to sign the back of their shirts. Did fans bother you while you ate dinner in a public restaurant? I never had time to go out to eat dinner! I was in the TV studios all the time. I ate my meals there. And if it wasn’t the TV studio then it was lecture halls and ceremonies or in the cars that took me around. Do you still enjoy appearing on TV? Not at all. Oh, how much it has changed. Back then the studios were very eager to hear the truth from me — about France, or about what I thought of Japanese culture. I would go straight into the studio and we would have intelligent discussions live on-air. It’s so easy to bluff on TV now. Everything became sugar-coated, starting about 10 years ago. I do a few programs now, but generally speaking, I don’t want them and they don’t want me. But your success wasn’t limited to TV, because you wrote quite a number of books, too. Your “Shippai Shinai Oshare” (“How to Dress so as Not to Fail”) was quite a success, I believe. Yes, the book did very well. It was incredible. And all the books I wrote were in Japanese, for Japan — except one. Ah, that would be your autobiography, “La Gaijine”? Yes, that was published in French first. It was about me and my life in Japan, as well as Japan itself as a society at the time. And how would you describe “back then”? In the 1950s, ’60s and ’70s, it was such a lovely country, with a lot of traditional houses with the most beautiful gardens. In the ’50s, I met a man whose house had been devastated by the war, and he and his multi-generational family would take turns sleeping because the house wasn’t big enough to lay down futons for everyone. And they never complained once! Everyone was also very smiley, and very thirsty for information and culture. It was that Japan that I fell in love with. Well, I can tell you that before the ’80s we didn’t have the word “taihen” (trouble). What do you mean you didn’t have that word? Well it existed, yes — but noone ever actually said it. Can you tell me about your husband, Tatsuji Nagataki, who is an acclaimed author in his own right? When did you two meet? I met him on my second time around in Japan. I had been away for 10 years, working for Christian Dior in Paris and Revlon in New York, and was back in Tokyo at the behest of Chanel. There was a TV show on TBS that Tatsuji hosted and he invited me to be on it. 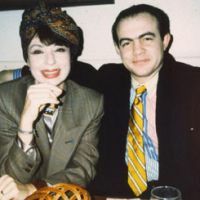 He was a Francophile himself and could speak French, and I, of course, was already enamored with Japan — so it was a good fit. Well, I was really attracted to his style. But to be honest, I slapped myself on the wrist and said, “No! You musn’t!” I was divorced at the time, but I knew it could be trouble. So I was on his program, and it was extended to 90 minutes because he asked me so many wonderful questions. And he never went into “Can you hold chopsticks?” territory. No, he asked me serious questions, such as what did I think of the atom bomb, or about the birth-control pill. It was kind of inevitable, because soon after that we got together and were engaged. But it was nearly a scandal! How so? Because of who you were? Yes, I was quite high-profile and he had just started his career. Plus, he is 13 years younger than me. And I was a French woman. Ours was an interracial marriage, and that was not yet common. But Tatsuji was by my side, and he told me, “We need to control the media. We will eat them before they eat us.” We had to do the media conference and everything. It was a blitz. And how has he affected your life? For better or worse, he is the love of my life. And he has done for me what no one else could, and that is help me navigate the cultural differences between Japan and France. I am very eager to appease cultural rules and nuances, and Tatsuji has often guided me in the right direction so I do not make mistakes. For example, when we were engaged, we went to see each other’s families to get permission. Tatsuji advised that this was the proper thing to do, and the media was watching. He was right, too. And not only him, but I am indebted to my editors as well. In the case of “Shippai Shinai Oshare,” I had wanted to call it something more along the lines of “Dress for Success.” But my editor advised me that in Japan, this was too strong and the book would fail. And he was also right. Japan is very protective of its minute traditions and nuances, and I wouldn’t have known about them otherwise. You just spoke of making cultural mistakes. Have you ever accidentally done something really seriously unfortunate? Well yes, I remember once I was being filmed for a TV show and an important man walked onto the set. All of the men stood up, but I did not. In France, it is very rude for a woman to stand up when someone enters the room. But in Japan, everyone must do so. I didn’t know that, so I just sat there not even knowing I was doing something gravely wrong. Immediately after it aired I had angry phone calls and gossip swirled. Another time I got in trouble for putting my hands in the pockets of a dress I was wearing on-air. It was a Comme des Garcons dress and it was a little too big so I was just trying to hold it up. The vitriol that came from that — it was so silly! Do lots of things irritate you? After growing up through the war, it really comes down to this: Is it a life-or-death situation? If not, then it is not a big deal. Once I had some lipstick on my blouse and an assistant began making a huge fuss, “Morechand-san! Morechand-san! There’s lipstick on your blouse!” And I just thought, “Okay, now you’ve told me I’ll just cover it up. Don’t make a fuss.” But this is where our cultural differences collide. Can we go back to fashion again? You have undeniably had a hand in bringing French fashion awareness to Japan. What was your relationship with these designers? I got along really well with French and Italian designers. 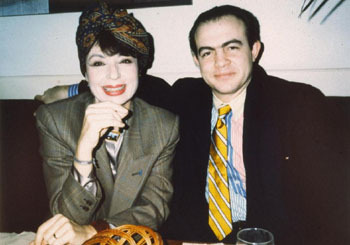 I was very good friends with Christian Lacroix. I also modeled for designers in their Tokyo shows, such as Pierre Cardin and even Christian Dior haute couture when it was first sold at Daimaru. I was one of the first women to buy a pair of Yves St. Laurent pants. Those were really comfortable! But I also loved the otherworldly designs of Thierry Mugler. You could hardly walk in those without assistance, but I probably wore every piece of his! I believe you also have a great liking for Japanese designers as well? Oh yes! I think Yohji Yamamoto is classic and elegant, Comme des Garcons is brilliant, and Issey Miyake is fantastic as well. I can tell you something about Miyake; at the beginning he had a lot of trouble getting noticed by the local industry. I had been told about a small shop in Aoyama and when I went in to look at the clothes, I thought that the pieces were easy to wear but also intelligent and beautiful. They reminded me of the artistic and elegant clothing that the wives of artists would wear in the Parisian ateliers. So then I said to everyone around me in Japan, “You have a wonderful designer, Issey Miyake.” But still he didn’t make a breakthrough. A few years later he went to France and the journalists there loved it — then he was a success. They said, “Oh, his designs are so smart but elegant” — exactly what I had said! But it was only then that he was appreciated in Japan. He doesn’t talk about this now, but he remembers that the local industry wasn’t very kind at the beginning. I think they know about the designers here but they don’t appreciate them. You are a big proponent of young Japanese designers as well, and you often go to their shows. Who do you have your eye on now? I think the menswear brand Phenomenon is really fantastic, and I look forward to seeing what they can do. I try to go to the shows to offer support, but not to report on them. If I were asked to write about fashion now, I honestly could not do it. Things have changed far too much. I feel there is really no ideology behind the designs anymore. In the ’60s, music was behind fashion. In the ’70s it was trends. The ’80s were about money, money, money. The ’90s were subdued, and a bit glum. The 2000s are about being fun while striving to be original. But it’s so hard to be original these days. Really, it’s impossible. You could go down Omotesando (an upscale shopping street) nearly naked and that’s not even shocking! Well, it might turn some heads at least, but certainly not spark a revolution. The only thing controversial nowadays would be if you covered yourself head-to-toe like a nun. You were also on the team behind the launch of Japanese Vogue. What was the concept behind this? I was vice-president of Conde Nast Japan, the publisher. I wanted to have a magazine that was intelligent, not syrupy or vapid. I love fashion when fashion has a meaning. So we launched it, although I was only there as vice-president for four years. I stayed onboard as a counselor for much longer, however. In the fashion industry, you must have a big personality and be a bit namaiki (cocky). But this is for the sake of the magazine, it’s not about being impudent for yourself. However, in Japan, this namaiki nature doesn’t work very well. Unfortunately, I think that having a belief is sometimes misconstrued here as having a bad attitude. Do you mean that, in Japan, a person’s identity gets lost? Yes, and identity is so very important to me. I stood for my identity as a young girl in Paris, and I am proud of it. And I want the Japanese to be proud of their identities, too. I do not work in fashion anymore, but I still have a mission that I tend to with lectures and essays. That mission is to remind Japanese of their identity, and how precious it is. So I study their history and remind them of how wonderful it is. All throughout my life in Japan I made sure to learn about Japanese arts and culture, because they are really exquisite. I think the next step after globalism is going to be localism, and that means going back to one’s roots. So is retirement out of the question?